Creative game-based learning will be discussed by renowned experts and artists as part of Summer of Minecraft’s culminating event Aug. 4 at USC’s School of Cinematic Arts. The celebration will showcase the work of counselors and campers who took part in Connected Camp’s summer MInecraft camp, and offer a glimpse into the digital and games labs at the School of Cinematic Arts. The camp, organized by Connected Camps and the Institute of Play, in partnership with USC, and several other community partners including the LA Public Library and LA Makerspace, was offered online and in local libraries. 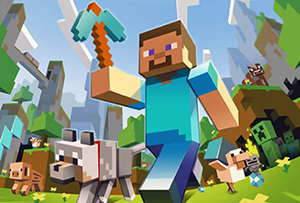 Tuesday, Aug. 4, 11:30 a.m.-5:30 p.m.
11:30 a.m.-1 p.m., SCI Room L114 — Learn how Minecraft can maximize learning. Speakers: Mya Stark, director of LA Makerspace; Brendon Trombley, Institute of Play and Connected Camps game designer. 1-2:30 p.m. SCI Building Lobby — Tour the USC School of Cinematic Arts digital and game labs, including the Mobile and Environmental Media Lab, Mixed Reality Lab, Game Innovation Lab, and World Building Institute. The labs’ researchers are actively investigating the future of digital cinema and the development of new forms of screen-based entertainment such as games, immersive narrative, distributed mobile media and the technologies that underpin them. 4-4:30 p.m., SCI Room 106 — Panel discussion on creative and connected learning. Moderated by Mimi Ito, MacArthur Foundation Chair in Digital Media and Learning at UC Irvine and co-founder of Connected Camps, the panelists are: Lili Cheng, distinguished engineer at Microsoft Research; and Joi Ito, MIT Media Lab director. The panelists will discuss how Minecraft can provide a social environment and resources to support connected learning, creativity, problem solving, and technical literacy. 4:30-5:30 p.m. SCI Lobby — Closing reception. Panel discussions will be livestreamed, and members of the media will have access to photograph and interview participants. In an effort to get all kids creating, collaborating and learning to code, Connected Camps, a new benefit corporation, partnered with Institute of Play, a nonprofit organization, in offering a low-cost, four-week online Minecraft camp. The “Summer of Minecraft” camp commenced July 6, and young campers and parents, were taught everything from the basics of building to coding skills in a safe multiplayer environment. The camp featured live broadcasts, online discussion with campers and experts, and collaborative design jam events where participants created community-driven projects. The camps were staffed by trained camp counselors who are Minecraft experts. In addition to the virtual camp experience, Summer of Minecraft supported local camp experiences and a teen camp counselor network in Los Angeles, in partnership with the University of Southern California’s School of Cinematic Arts, Los Angeles Public Library and Los Angeles Makerspace. The community-based programming was supported in part through a gift from Microsoft Research. Connected Camps and Institute of Play are members of the Connected Learning Alliance, which supports the expansion and influence of a network of educators, experts and youth-serving organizations mobilizing new technology in the service of equity, access and opportunity for all young people. Launched this month, Connected Camps is a benefit corporation providing connected learning experiences that foster creativity, problem solving, collaboration and interest-driven learning. By leveraging the power of open networks and partnering with community-based organizations, Connected Camps is committed to delivering the highest quality online learning experiences to young people in all walks of life. Institute of Play is a not-for-profit design studio that pioneers new models of learning and engagement. At the core of the experiences the Institute creates are games, play and the principles that underlie them. Using these principles, the Institute has created successful institutions, games, programs, events, digital platforms and products. Its first project was the design and launch of the innovative New York City public school, Quest to Learn.